Looking for a savvy part of Sydney to kick up your heels or hang your hat each night? What about Woolloomooloo? Channelling its own cool Sydney vibe, Woolloomooloo is full of great bars, inner-city arts venues, and is on the doorstep of all the city’s sights, from the Sydney Harbour Bridge to the boutique shops of Surry Hills. Just three kilometres from the Sydney CBD, Woolloomooloo has Kings Cross and the Royal Botanic Gardens as its neighbours. Check out our Woolloomooloo hotels now and snag a great spot for your next Sydney stay! Many Sydneysiders love Woolloomooloo for a great meal and a trendy night out. Full of fine dining restaurants to don your finest rags for, as well as fantastic bars and lively pubs, much of it revolves around Woolloomooloo’s historic Finger Wharf. This area oozes charm and character, and the views across the stunning Sydney skyline and harbour surrounds set the scene for a wonderful night out – especially if you’re not into the bopping beats and frantic atmosphere of nearby Kings Cross. The arts are also savoured in Woolloomooloo. Don’t miss the Artspace Visual Arts Centre, a leading international residency-based contemporary art centre fronting onto Sydney Harbour. Also worth your time is the nearby Art Gallery of NSW. For art that moves, head to the Old Fitzroy Theatre, one of the city’s first independent live theatre companies. If you love to ogle beautiful architecture, you will fall in love with Elizabeth Bay House. Built between 1835 and 1839, it was known as ‘the finest house in the colony’, designed by the most fashionable and accomplished architect at the time. One bonus you simply can’t overlook about Woolloomooloo is its prime location. Here, you can even walk to the CBD through the Royal Botanic Gardens if you want! Also within walking distance is the gorgeous Potts Point, bustling Kings Cross, and trendy Paddington. 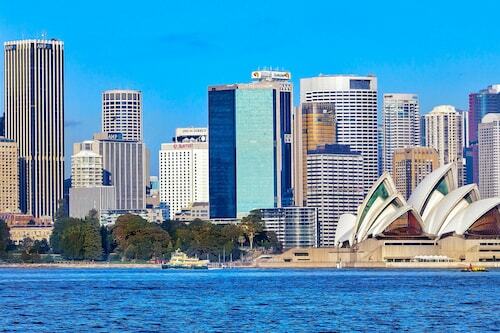 Whatever you want to do in Sydney – it’s all on your doorstep when you stay in Woolloomooloo! Woolloomooloo has its own trendy dining and bar scene, a piece of Sydney’s arts scene, and is on the cusp of the CBD with its own Sydney Harbour views. Wot more could you want? Book one of our Woolloomooloo accommodation options now and live it up in Sydney! How Much is a Hotel Room in Woolloomooloo Bay? 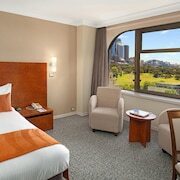 Hotels in Woolloomooloo Bay start at AU$152 per night. Prices and availability subject to change. Additional terms may apply.